When the styles of the 1920s appeal to you, there are Stacy Adams Madison shoes. These classic cap toe style shoe was there during the roaring twenties and prohibition. They were seen on the feet of countless men in the speakeasies secretly taking their drinks on the down low. Madisons have the timeless appeal that few shoes are able to muster and their popularity is no accident. They just look good. Sure they have that period correct 1920s style that was the fashion of their day but they have a very strong fan base down south as well to this day. 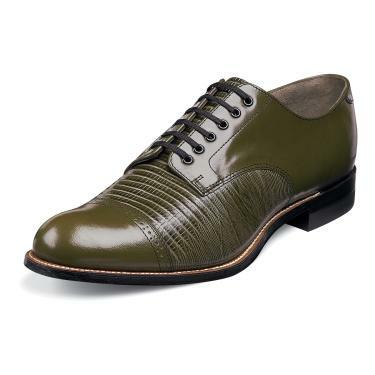 This Earthy and rich color olive green Madison shoes has a combination of lizard printed leather uppers with smooth kidskin leather to give it welcome contrast of texture. They also come with a very nice nice fully stitched leather sole with Goodyear Welt construction making them long lasting and worth what you pay for them.